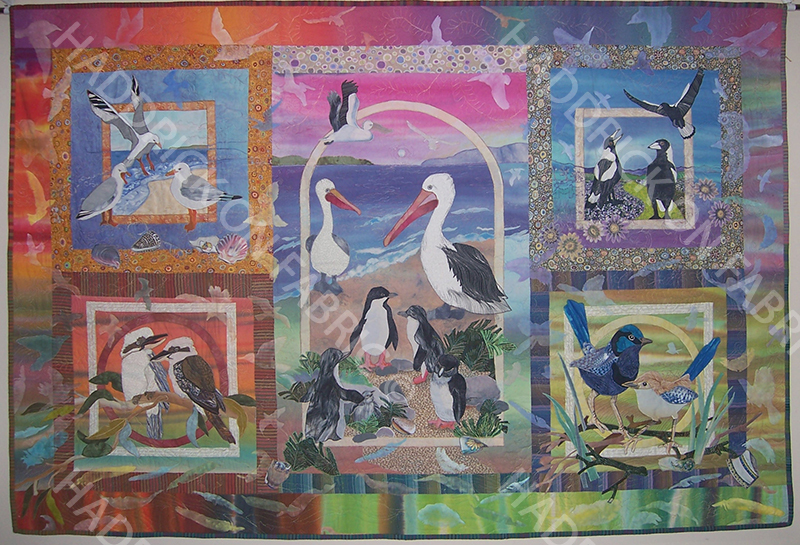 Five small quilts in the series ‘Birds of Australia’ form the basis of this design. Pelicans featured in the centre, show the Murray River as it meets the Southern Ocean at Goolwa, South Australia. The Fairy Penguin waddle ashore at dusk near Burnie Tasmania, while the Silver Gull hover and squabble over the never ending sea flotsam at Victor Harbor. The ‘Blue Wren’ feeds in low lying scrubby vegetation in Deep Creek Conservation Park, the Kookaburra laugh loudly to advertise their territory in the Adelaide Hills, while the Magpie with its’ warbling, ‘flute like’ sounds warn any intruders and are quick to swoop on unsuspecting visitors during their breeding season. 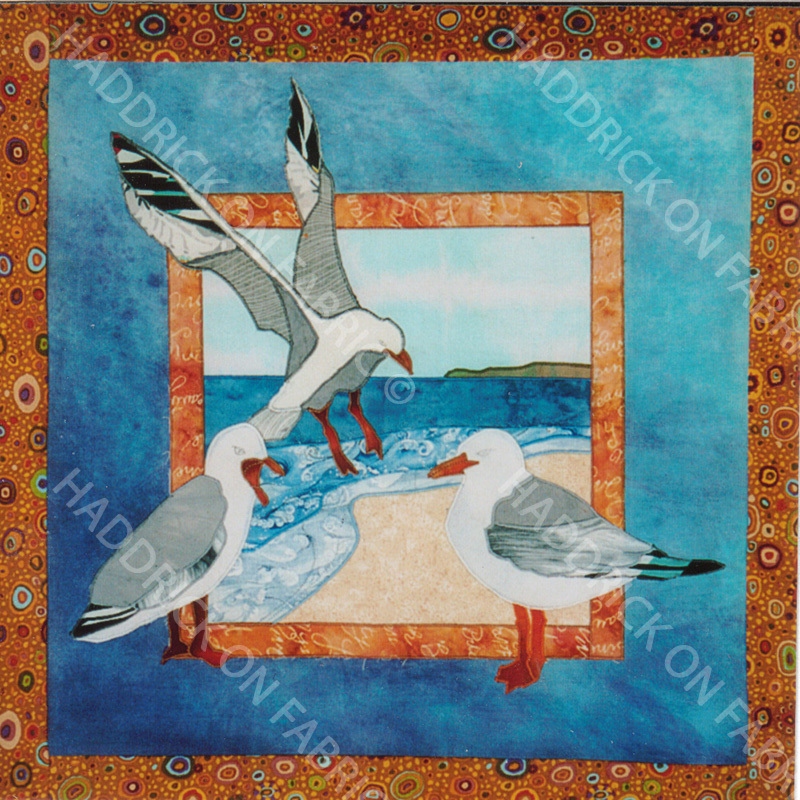 Numerous drawings of these birds as well as leaves and feathers are stencilled over the quilt borders, providing another level of decoration on which to focus my extensive machine stitched quilting designs. 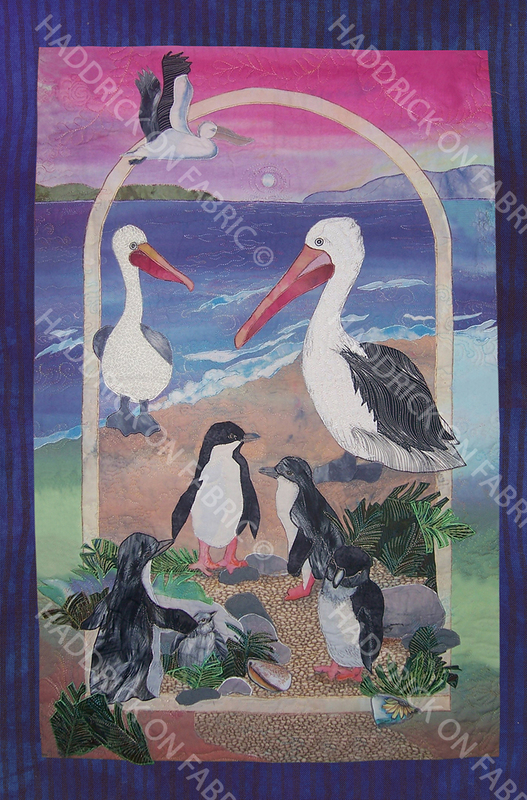 Winner of Best of Country (Australia) - Bernina World Quilt Show 2005. Hand dyed, painted & printed fabric: machine pieced and quilted.